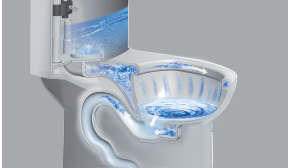 Excellent flushing performance is achieved at 4.8 liters per flush. Stronger water pressure vortex technology and 3 inch larger flushing valve. Larger glazed trap way provides smoother water discharge with no blocks.